If your wedding guests include at least a couple of out-of-towners then offer them the option of a room in a local hotel. You can assess the hotel for them, probably get a discount for a ‘block’ booking, and make it easier for your guests rest easy on the night of your wedding. But, unless you’re an expert event organiser you’re going to know very little about how to book a block of rooms for guests for your wedding. 1. Know when check-in and check-out times are – most of your guests will probably arrive in town on the day of your wedding. And they’ll need time to change and freshen up before hand. If you’ve an early afternoon wedding, and they only get access to their rooms after 2pm, things could get a little sticky. 2. 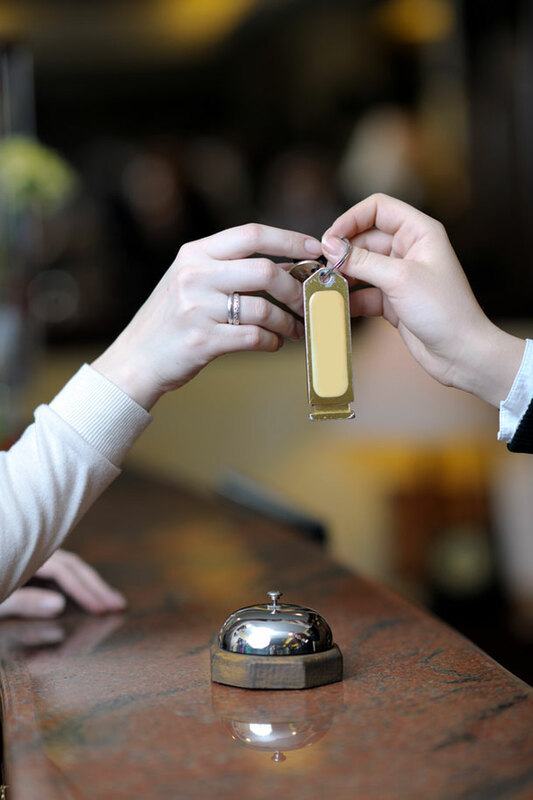 Go in person to the hotel – whilst it’s time-saving simply to call the hotel to speak to the events co-ordinator, you will get an all round better deal if you look over the hotel and speak to someone face-to-face. This doesn’t mean that you’ll get a cheaper deal, it just means that you’ll ask a different series of questions when you’re actually there, viewing rooms and getting an idea of your guests’ needs. 3. Know how many rooms you’ll need – once you start receiving RSVPs do a few calculations. You know how many friends and family you have flying in. Then consider the out-of-town guests (those who aren’t camping in your mother’s spare room) and family members who want to be closer to the wedding venue (and don’t want to have to drive home afterwards). Phone each of them to check. 4. The minimum number of rooms you need to book is usually around 10 to be considered a block booking. But if your need is lower, consider a boutique B&B as an option. 5. Make sure you read the fine print – find out about any additional fees, charges or discounts. Often hotels will want you to sign a contract if you’re booking 10 or more rooms. Make sure you undertand about cancellation and reservation fees and how much you stand to lose, should any guests pull out last minute. 6. Leave your wedding itinerary at the front desk (with extra copies for guests) so that everyone involved knows where, when and how. 7. Book your South African Hotel right now, for some wonderful inspiration visit Cape Town Hotels.